A mixed martial arts fitness expert explains how techniques that get Ultimate Fighting Championship® competitors into shape can appeal to a broad spectrum of fitness clients. The 35-year-old athlete called out the readout from her heart rate monitor after 45 minutes in our “Train Like an Ultimate MMA Fighter” session at the 2011 IDEA World Fitness Convention™. That’s a lot of burn in 45 minutes, and it gives an idea of the intensity of a mixed martial arts workout. The high calorie burn appeals to weight-conscious clients. Vigorous workouts address the growing popularity of high-intensity training. The popularity of MMA means a lot of the marketing is done for you. The training model can apply to other sports. Classes do not require extra equipment. Trainers can find programs to master MMA fitness modalities. The programming is “plug and play” with the right education and training. The popularity of UFC has generated a huge amount of interest in how MMA athletes stay in shape and prepare for battle. Strength and conditioning professionals must design a training regimen that accurately reflects the metabolic demands of the sport (Schick, Brown & Schick 2012). An MMA fight taxes the body’s phosphagen, glycolytic and oxidative energy systems (Schick, Brown & Schick 2012), requiring systematic, functional and sport-specific training that enhances these systems. Training techniques for other sports can be used as long as they fit with the sport-specific MMA approach. Next I’ll explain the steps we go through to prepare fighters for an MMA match. Even if your clients have no interest in engaging in physical combat, they may still enjoy the idea that they’re getting themselves strong enough for a real fight. Fight camp is the specific amount of time between matches; ideally it will get the combat athlete to peak conditioning just in time for the upcoming fight. It’s a serious commitment of time, generally 3–6 months. After the fight, I recommend that fighters take a week off to recover, and then begin preparing for the next bout. The prime goal of training is maintaining lean body mass, because there is a direct correlation between strength and anaerobic capacity (Schick, Brown & Schick 2012). Let’s go through each of these phases. MMA fighters need to build a foundation and rebuild from any injuries or muscle imbalances before they can move to the demanding later phases. We worked with 15 UFC fighters and found they needed to spend a minimum of 6–8 weeks in the strength phase. Heavy strength training that increases muscle mass must happen in this phase; otherwise, the weight cutting that fighters have to do in Phase 3 will be much more difficult. Explosive exercises such as plyometrics have been around for years. Although studies have documented that plyometric training can improve muscular power, you need to be especially careful about frequency and duration (Robertson & Lahart 2010). The challenge with many of these exercises is the nature of the movement: Because they are ballistic, they can cause injury if not properly coached. Also consider the surface that the athlete is training on—combat sports in particular have a high degree of impact and injury potential. We have found it extremely useful to implement equipment such as BOSU balls, rubberized medicine balls, and fitness trampolines like the JumpSport® to gain all the benefit without the impact. We’ve learned that plyometric training helps UFC athletes if they do it after the strength phase. We have also found that plyometrics improves the athletes’ proprioceptive awareness and decreases injury risk. Weight cutting. MMA athletes must fight at a certain body weight, and many go to great extremes to “cut weight” before a match. This requires a slow progression approach and close monitoring by the nutrition and strength coaches so the athlete peaks on time. Before the fight, MMA athletes have to exercise at a higher intensity to burn extra calories and lose weight. Monitoring proper caloric intake is mandatory. Overtraining. It’s essential to focus on the potential threats of overtrain- ing, which can lead to injuries. Proper “tapering off.” Trainers need to decrease the volume and intensity of the workouts when approaching the competition (Wells 2008). Because every athlete is different, some may need a few days of rest, while others may require up to 10 days. The coaching team needs to work together and listen to the athlete during the tapering-off phase. The principle of specificity holds that the sports training must reflect the activity to generate the proper training effect. 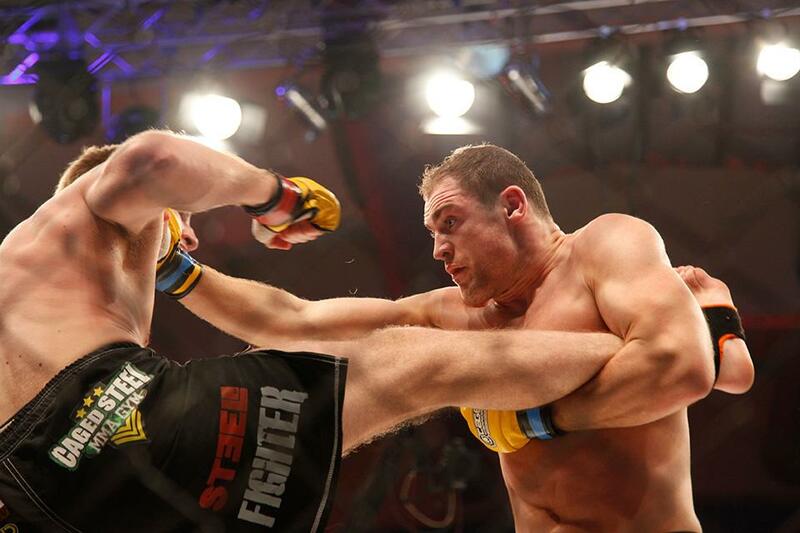 We base our MMA training on a work to-rest ratio of about 2.2 to 1, though we have seen increased endurance in our athletes with a slightly higher work-to-rest ratio. We base our formula on the amount of “real time” in the cage or a fight, and many of the exercises in this workout resemble fight moves in the ring. The formula of nine stations—35 seconds of work with 15 seconds of rest, and a 1-minute break between circuits (nine in all)—worked effectively, giving fighters more endurance in the later rounds of a match. As I noted in the introduction, high caloric burn is another benefit of this stage. We have clocked caloric burn at 475 calories in 17 minutes for a UFC athlete wearing a heart rate monitor. This program has proven effective with UFC fighters and other athletes. It can be adapted by trainers everywhere for a wide variety of clients. I have used this model effectively with clients aged 8–88. An MMA workout is a win for both client and trainer. The client walks away with a unique, fun and multiplanar functional workout. The trainer walks away with an ability to employ current equipment with new proven protocols that can be used for combat athletes or the general population. After all, everyone has a fighter within them! Gambetta, V., & Odgers, S. 1999. The Complete Guide to Medicine Ball Training. Gambetta Sports Training Systems. Rooney, M. 2008. Training For Warriors. New York: Morrow. Santana, J.C. 2004. The Essence of Bodyweight Training. Juan Carlos Santana. Santana, J.C. 2008. Strength and Conditioning for the Modern Gladiator. Intocombat. Sheridan, S. 2008. A Fighter's Heart. New York: Grove. Want more from Kevin J. Kearns? Robertson, P., & Lahart, I. 2010. The design of a judo-specific strength and conditioning programme. Part II: Judo-specific strength and conditioning methods. Journal of Sports Therapy, 2 (1), 2–10. Schick, M.G., Brown, L.E., & Schick, E.E. 2012. Strength and conditioning considerations for female mixed martial artists. Strength and Conditioning Journal, 34 (1), 66–75. Wells, G. 2008. Tapering: The real art and science of coaching. Australian Sports Commission. www .ausport.gov.au/sportscoachmag/planning/tapering_ the_real_art_and_science_of_coaching; accessed June 5, 2014. 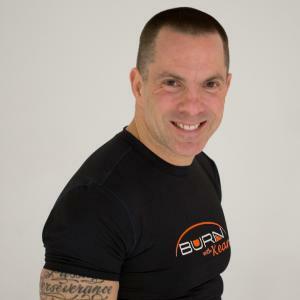 Kevin is the founder of Burn with Kearns Fitness, a provider of personal training and group class leader based certifications and workshops. With a Bachelor’s degree in Exercise Science from UMass Boston, he has over 23 experience in the fitness industry and an extensive background in the martial arts. Kevin has produced 6 conditioning DVDs and contributed to Men’s Fitness and Maxim Magazines. He serves as the strength and conditioning coach for numerous professional MMA fighters. ... read more.